The mountain of Seoraksan in Gangwan Province is one of the most scenic settings in South Korea and is a UNESCO Biosphere Reserve. Seoraksan National Park is home to the country's third highest peak, reached by means of a variety of trails up the mountain. For the less physically inclined, there is a cable car that runs some of the way up the mountain. 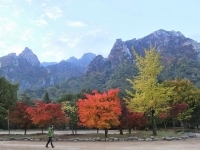 The most popular time to visit Seoraksan is during autumn, when the surrounding foliage creates a visual feast with the leaves changing from green to the colours of auburn, red, yellow, brown, and gold before dropping. Seoraksan is best accessed from the small seaside city of Sokcho on Korea's east coast. Aside from the gorgeous flora, there is also a host of wild fauna to spot in the reserve. Together with rare plants such as Edelweiss and diamond bluebell, endangered animals like the Amur goral, Korean musk deer, and Tristram's woodpecker are also found within its borders. A total of around 2,000 animal species exist in the park.